First Touya & Yukito color illustration from the Clear Card era! It’s uni time for them. I like the change of perspective in this illustration. The previous ones were nice but too one-dimensional. So the continuation of last month’s cliffhanger was a little anti-climatic. Nothing happened inside the “dream” with the cloaked figure. Touya is obviously concerned. I guess everybody agrees that Tomoyo’s hair in this chapter deserves all the love in the world. In fact, CLAMP are really putting a lot of effort into coming up with different hairstyles for her in Clear Card and we’re totally diggin’ it! I really miss Tomoyo recording Sakura in action. She’s missing out most of it…. That reading of “Ten Nights of Dream”, followed by Sakura pondering about the visions she’s having of the cloaked figure, made me have second thoughts about it. Maybe we’re in a for a change. Maybe the visions/dreams are not showing the future this time around, like they once did with Kaho and Eriol (Syaoran too? Or was it only in the anime?). So Akiho is joining the chorus club, huh? I guess that makes sense. Later at Tomoyo’s house, she’s taking Syaoran’s measures to make him costumes! We’re having matching costumes for Sakura and Syaoran, how nice is that? Tomoyo the ultimate shipper! She points out that Syaoran has grown and has gotten more manly, except that the drawings are not *quite* reflecting that xD I sincerely hope the next chapters will reflect more their aging (I’ve been hoping that since Chapter 1). I’m actually looking forward to these matching costumes. Does that mean that we’re about to get more Sakura & Syaoran in action? They all sense a strange wind, and Syaoran surprises us all by not only not leaving the scene but also pulling out his sword using a brand new technique never before seen in Card Captor Sakura but quite familiar in Tsubasa. The fact that Kero notices it and asks him where he learned the technique makes me think that there might be a connection with Tsubasa and the time Syaoran spent in Hong Kong. Then we see a very self-assured Sakura handling the situation all by herself, and nailing it with her kindness. The strange wind turns out to be another card, of course, and it takes the form of a lovely bow that allows Sakura to fly. She looks so graceful! This was a nice change of pattern. It’s the first time Syaoran is present when Sakura is securing a card. There is also a 7-pages bonus chapter that takes place before the events of Clear Card arc. You can find the translations in the same link. I just want to point out that Kero and Suppi are playing the Magic Knights Rayearth game in it and I find that amusing. So in total we had a fat 37 pages chapter this month, which is very nice. I wonder where they are gonna add this bonus chapter in the tankoubon — that is, considering it’s going to be added. 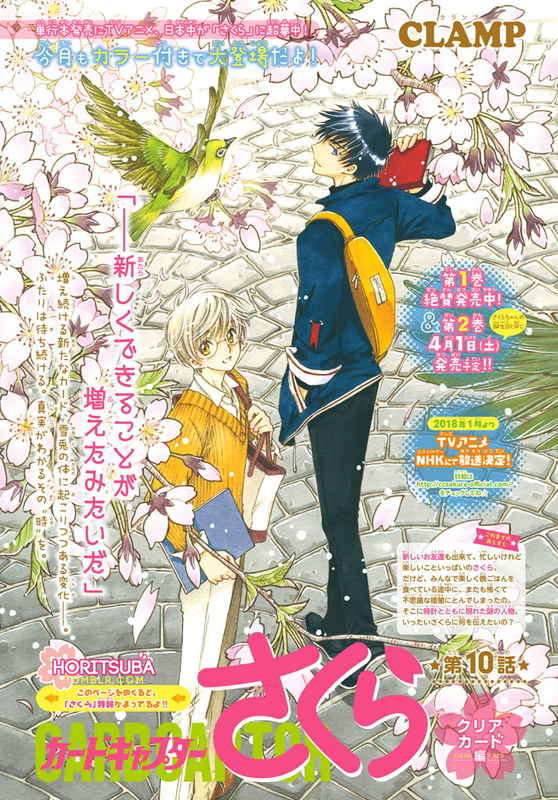 Next chapter will be out next month, we’ll have a color spread and Sakura will be in Nakayoshi‘s front cover! It’s obvious, but, WOW RAITEI SHOURAI!! I checked, Tomoyo is refering to Shaolan as Li-kun. Then she speaks of “Sakura-chan’s and Shaolan-kun’s moment” when they are dressed up. For the card, I think we see 2 of them in the chapter : the record, and the flying one that hasn’t been secured yet but will probably be in the next chapter. 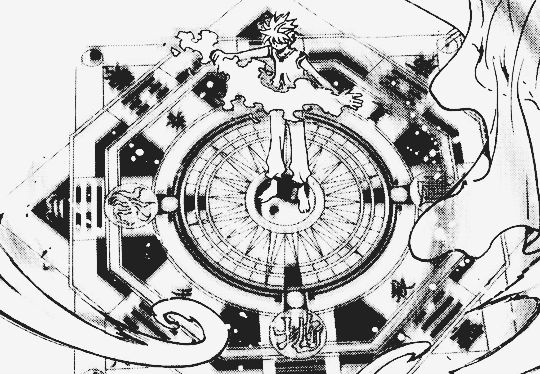 About the cards, there are 2 of them, the very docile one which cooperated quite easily with Sakura and allowed her to fly, even though Sakura didn’t even capture/seal it yet @_@ (the Clow Cards never did that, they had to be sealed under her name first before she could use them). And then we got The Record. Something else, of course, is his use of magic, FINALLY! We waited 10 chapters for this!! The other thing is that I don’t know why she felt the need to look back pointedly at Sakura and was so ridiculously happy at the sight of her support. She is strangely attached to her, but I’m not saying anything new, CLAMP has established that fact since the very first chapter Akiho appeared in. Yeah, Sakura is always interacting with the cloaked figure whereas with Kaho and Eriol she was more of a expectator. I guess there are really 2 cards, then! But that sequence was badly designed. It’s very confusing and it feels like it’s only one card. I agree that Akiho is starting to be a little annoying LOL c’mon girl, be more assured of your own qualities and skills. It’s a well-drawn chapter I liked that. Again there are more questions than answers. Those dragons (at the end of chapter 2) and clocks remind me of X… and I’m looking forward to learning more about that special person who takes care of Akiho and the reason why almost everyone seem so concerned about Sakura. 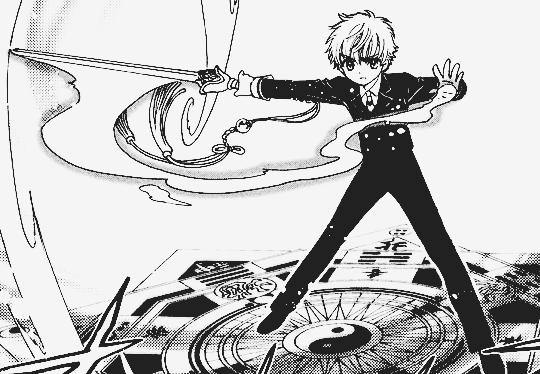 And Syaoran of course! I want to know what happened in Hong Kong. I’ve heard many theories…like people thinking he is Tsubasa Li. I don’t think it is possible. What kind of connection do you think there is between the two stories? It’s not as if anything BIG happens, but there are several reasons that contribute to make it one of my favorites in some time. I must admit that this is still a weak point, even though Sakura looked “older” especially in that scene where she thinks about foretelling dreams…she reminded me of Sakura in Tsubasa, in the more serious part, and I loved that. I always love when a character is drawn in all kind of expressions, even the ones that seem like “they don’t fit”. Sakura is particularly beautiful when depicted in a serious look. But the pics Sherry posted above are a blatant example that they still look too young to be almost 13: Tsubasa Li’s got almost half the age of Syaoran there….and yet they look about the same age. Ridiculous! Now, onto the cards: my understanding here is that Sakura is dealing with TWO cards, as someone else pointed out! She’s still flying with the bow on her back when she secures Record, so it can’t be that. She’ll probably secure the “bow” in the next chapter! Also, does anyone else think it’s strange that Sakura kept saying “How cool it would be to record anything immediately” since last chapter, and she’s got a Record card this time around? Is this meaning that the cards come to her basing on her wishes? Or what other kind of link is there? (Don’t tell me it’s a coincidence, that just doesn’t exist in CLAMP world). Oh, Syaoran. The headaches you’re giving to this fandom. When you’re bringing the fandom on the verge of hating you, you suddenly ARE PRESENT to the capture of a card AND even try to do something about it! And that technique to get the sword out….CLAMP really wanted to tease our hearts, isn’t it? But now I wonder: is the red light off? Can he intervene on the scene, from now on? Or was it just a show? Aaaaand next issue is celebrating Sakura’s birthday!! I’ll say it here, let’s see if I’m right: next issue there will be a big announcement, probably about the anime!! April is a magical month for CLAMP and CCS, after all!!! I almost pointed out again that this was another well-drawn chapter. So for all effects: I agree, we had two very well-drawn chapters in a row. It guess there really are two cards, then! But that sequence had some serious continuity problems. So NOT clear what’s going on. I hear you when you say the cards might be a materialization of Sakura’s wishes, it does seem to be that way with RECORD, but what about the previous cards? Do we have any evidence that she wished for things that would justify GALE, SEIGE, ACQUA, ACTION and REFLECT? If Syaoran is faking it, he is doing a pretty good job because he looked very concerned. I hope you’re right about April! If it can help influencing Mokona’s style, making it even more realistic, it’s all welcome! Do we have any evidence that she wished for things that would justify GALE, SEIGE, ACQUA, ACTION and REFLECT? I can’t justify those, but this time it really seemed like that…. Nah, I don’t think he’s faking it, I don’t believe in that myself, but I find it weird that he waited until now to intervene….. When I first saw the chapter without the translation, I thought that the sound that Sakura was hearing was the same sound that Princess Sakura heard in the first volume of Tsubasa. But then, the fan translation said it was more of a buzzing sound and when I compared the writing of the sound effect, I realized that it was slightly different. I thought that it would be the first hint of Sakura crossing over with Tsubasa. (Slightly dissapointed) But then, as everyone said before, Syaoran brought in some action and showed the connection between Tsubasa that I was waiting for. Hummm a few people have pointed out that they are similar but personally I don’t think it’s related to Tsubasa. The card’s power is to record things so its design has recording devices, including a feather that represents writing. I can’t wait to see where the story will go this time ! I’m just a bit sad to see the number of pages every month… The tankoubons look small compared to those for the two Cardcaptor arcs. I believe this is your first time commenting here? If so: bienvenue! I was a little disappointed to see that the tankoubons are 20 pages shorter than usual. It’s like they are trying to release more tankoubons in the shortest amount of time. Hopefully the anime will cover any extra story that the manga did not. Thank you for reading my reviews every month, and I hope to read your comments from now on, too! Merci beaucoup! Et oui, je suis un homme =) I love French and your english is great! I just finished Magic Knight Reyarth and they made ambiguous relationship in it too !